Anonymous Hackers said : We can Delete the Censorship from The World ! La censura di internet stà invadendo il mondo. Gli stati non censurati stanno scomparendo. Dobbiamo rovesciare questa situazione! We Are Anonymus. We are legion. We do not forgive. We do not forget. Expect us. Contribuisci alle operazioni del gruppo Anonymous e aiuterai a rendere libero il mondo. 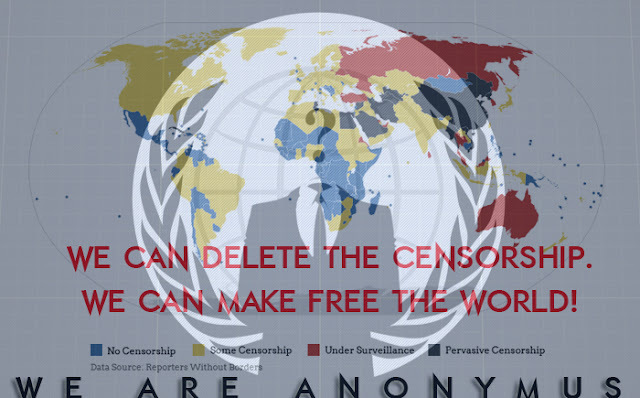 Censorship of the Internet is invading the world. The states which is uncensored are disappearing. We must reverse this situation! Contribute to the operations of the group Anonymous and help in freeing the world. La censura de Internet está invadiendo el mundo. Los estados estándesapareciendo sin censura. Tenemos que revertir esta situación! Somos Anonymus. Somos legión. Nosotros no perdonamos. No nos olvidamos.Esperan de nosotros. Contribuir a las operaciones del grupo anónimo y ayuda en liberar al mundo.